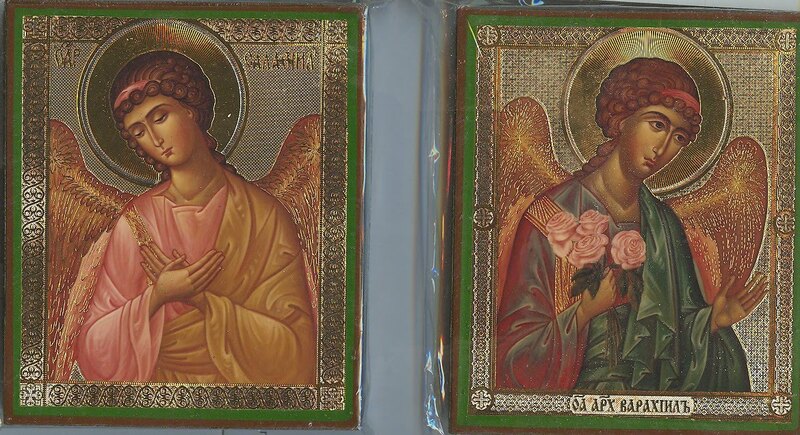 Tthe Holy Church, which rejects the impious worship of angels devised by idolaters and heretics of old, has received from the divinely inspired Fathers the tradition of celebrating with reverence the Synaxis of the Holy Angels. In the days of the Old Testament, the people of God, having fallen away from their Creator, began to worship that which the Lord created. They made idols after the likeness of things visible, of that which is in heaven above and earth beneath, the work of their own hands. At that time, when the people offered oblations unto the sun, the moon, and the stars as gods, imagining that these possessed living souls, they also began to worship angels. The Book of Kings makes mention of this, saying that they "burned incense unto Baal, to the sun, and to the moon, and to the twelve signs of the Zodiac, and to all the host of heaven," that is, to the angels; for the host of heaven is comprised of the angels, as is said in the Gospel: "And suddenly there was with the angel a multitude of the heavenly host." This impious worship of the angels spread through many lands in the days of the holy apostles. The holy Apostle Paul sought to root it out when he wrote to the Colossians, saying, "Let no man beguile you in voluntary humility and worshipping of angels, intruding into those things which he hath not seen, vainly puffed up by his fleshly mind, and not holding the Head," which is Christ; for there were at that time certain heretics who made a show of humility but proudly imagined that they were like the angels because of their abstinence and the purity of their lives. These men taught that angels were to be worshipped in the same manner as God. 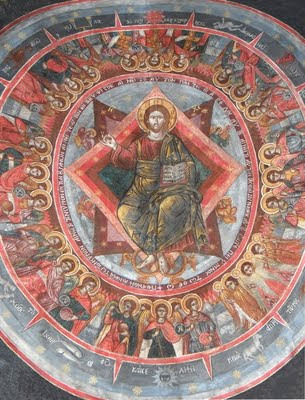 After this, there arose other heretics who taught that the angels were the makers of the visible creation and that they are more honorable and exalted than Christ, the Son of God, since they are bodiless.These heretics called the Archangel Michael the God of the Hebrews. Finally, still others appeared, who devoted themselves to sorcery and deceived the people, calling upon the demons whom they served under the name of angels. This heresy grew especially strong in Colossae, a city under the jurisdiction of the metropolitan see of Laodicea, where many secretly worshipped the angels in an impious manner akin to idolatry. The local council of the holy fathers that met at Laodicea denounced this heresy, but while it anathematized and rejected the heretical worship of angels, it decreed lawful the pious and proper veneration of the holy angels as God’s servants and the guardians of the race of man, establishing the celebration of the festival held in their honor on this day. 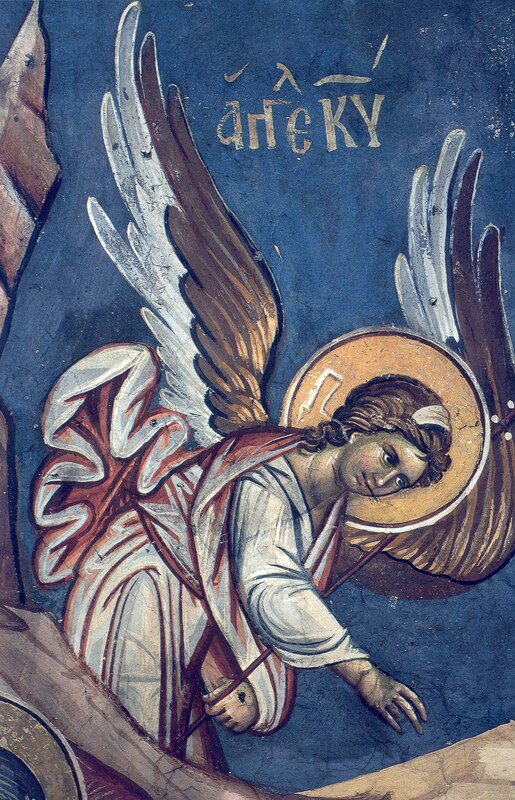 Thus it was in Colossae, where the evil and heretical worship of the angels had once appeared in secret, that the Orthodox first began to celebrate the feast of the Synaxis of the Angels. Many splendid temples dedicated to the holy Archangel Michael were built there, such as the most glorious and wondrous church erected in Chonae over the wonder-working spring where the holy Chief Commander Michael appeared to Saint Archippus. 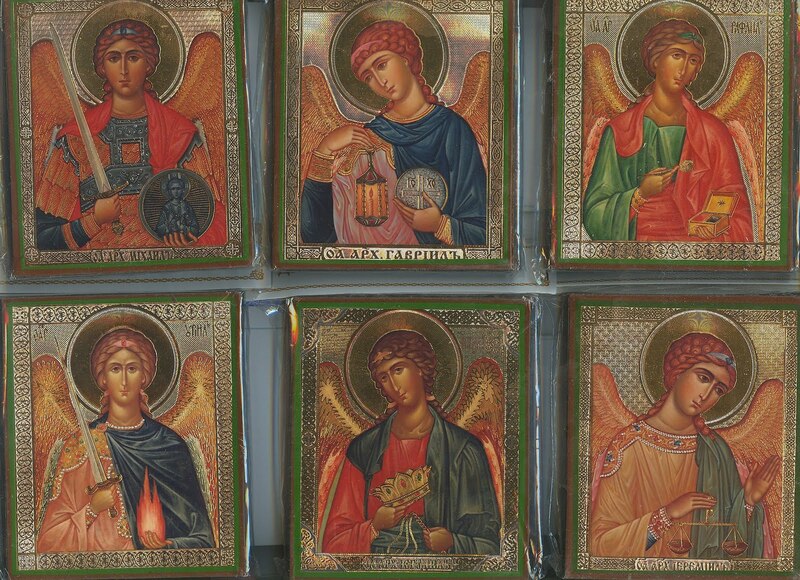 The council decreed that the feast of the angels be celebrated in November, the ninth month counting from March, when the world was created, since there are nine orders of angels, according to Saint Dionysius the Areopagite, the disciple of the holy Apostle Paul. Saint Paul was taken up to the third heaven, where he saw how the holy angels are divided into ranks, and he told his disciple of this. These nine ranks are grouped in three hierarchies of three orders: the highest, the middle, and the lowest. The highest hierarchy of angels, which is the nearest to the Most Holy Trinity, consists of the seraphim, the cherubim, and the thrones. 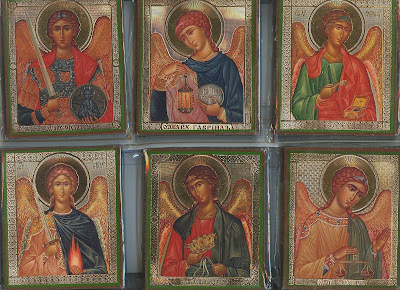 Closest of all to the Creator and Fashioner stand the seraphim, beloved of God, of whom Isaiah said, "Seraphs stood round about Him: each one had six wings." They are like fire, because they stand nearest to Him of Whom it is written: "Our God is a consuming fire, and His throne is like a fiery flame, and The sight of the glory of the Lord was like a devouring fire." Since they stand before such fiery glory, the seraphim are themselves fiery, as it is written: "He maketh His angels spirits, and His ministers a flame of fire." They burn with love for God and kindle the love of God in others, as their name itself reveals, for in the Hebrew tongue "seraphim" means "burning" or "consuming." The divinely wise cherubim stand next after the seraphim in the presence of God the All-knowing, Who dwells in transcendent light. These angels, who abide in God’s ineffable light, themselves ever shine more brilliantly than the orders below them with the light of righteousness and the knowledge of God and His wisdom. They are themselves radiant and illumine others; therefore, they are called cherubim, which in Hebrew means "much wisdom," or "an effusion of wisdom." Through the cherubim wisdom is poured out, and through them the noetic eyes of others are illumined, enabling them to see the glory of God and to know Him. The thrones stand after the cherubim before the exalted throne on high. They are called God-bearing by Saint Dionysius, since, according to the explanation offered by Saint Maximus the Confessor, God noetically rests upon them as upon noetic thrones. Saint Basil writes that they are called God-bearing not according to their essence but because of the grace vouchsafed them and the service entrusted to them. The flesh of Christ the Lord, however, is God-bearing by essence, hypostatically joined with God the Word Himself. Christ’s flesh bears God the Word in an undivided union and is called, and ever remains, His true and living flesh, but the thrones are called God-bearing because they bear God within themselves in an ineffable and inexpressible manner, not by nature but because of the grace and service entrusted to them. Seated upon them in a way that cannot be described, God ordains His judgments, as David said: "Thou hast sat upon a throne, 0 Thou that judgest righteousness." Therefore, it is through the thrones that God brings to pass His righteous judgments, for they are the ministers of His justice, imparting to the tribunals of magistrates here below, and to kings and lords, the ability to pass righteous judgment. There are three ranks in the middle hierarchy of the holy angels as well: dominions, powers, and virtues. The dominions are so called because they rule over the angels subject to them, while they are themselves free, since, as Saint Dionysius says, they have set aside servile fear and ever serve the Lord willingly and gladly. They pour down upon the authorities ordained by God here below power to rule wisely and to exercise dominion judiciously, governing well the lands entrusted to them. They also teach us to rule over our senses, to subdue our disorderly lusts and passions, to subject the flesh to the spirit, to exercise authority over our will, and to prevail over every temptation. The powers, full of divine might, serve the mighty and powerful will of the all-powerful and omnipotent Lord without hesitation or delay. They work exceedingly great marvels and impart the grace to perform similar miracles upon those of God’s favorites who have been deemed worthy to work wonders, to heal every illness, and to foretell the future. Likewise, the holy powers strengthen men as they labor and are heavy laden in bearing the yoke of their various burdens, strengthening them to fulfill the obligations of their station in life and helping the feeble in their weakness. They assist every man to be patient and not to weaken in trials, but to endure everything that comes to pass with nobility of soul and resolute courage, humbly giving thanks to God, Who orders all things for our benefit. The virtues bear their name because they have authority over the devil. They subdue the power of the demons and ward off the temptations which the spirits of evil bring upon men, and they forbid the demons to harm men as they desire. The virtues confirm those who labor for virtue’s sake in their spiritual undertakings and struggles, protecting them, lest they be deprived of the spiritual kingdom. Those who war with their passions and desires the virtues’ help in the day of battle, assisting them in dispelling every wicked thought and the enemy’s calumny and in overcoming the devil. The three orders in the lowest hierarchy are the principalities, archangels, and angels. The principalities are so called because they rule over the angels below them and direct them to fulfill God’s commands. It is they who watch over the world, protecting and guarding every kingdom and principality, every province and people, tribe and nation, for each of these has its own angel of this rank as guardian and governor. According to Saint Gregory, it is the duty of this order to teach men to render to all in authority the honor due their station. 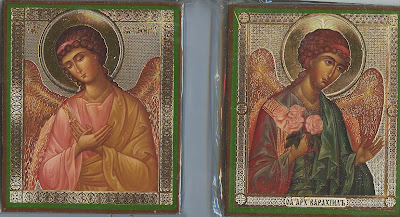 These angels usher worthy men into such positions as they merit and instruct them not to use their offices for their own gain or profit, nor to become vainglorious or full of conceit, but to honor God, to increase His glory and to spread word of it, for the benefit of all those under their authority. The archangels are the great messengers of good, eminent, and wondrous tidings. According to the renowned Dionysius, it is they who deliver prophecies to men, enlightening them so that they may know and understand the will of God. They learn of God’s will from the higher ranks and entrust the secrets thereof to the angels below them, who in turn declare them to men. Saint Gregory the Dialogist says that they spread abroad the faith among men, illuminating their minds with the light of the knowledge of the Holy Gospel and revealing to them the mysteries of the Orthodox faith. The angels occupy the lowest position in the hierarchy of heaven and are the closest of its ranks to men. They reveal the lesser mysteries of God and His intentions to men, whom they guide to live virtuously and righteously. Each of the faithful is entrusted to one of them. They support those of us who stand firm, and they raise up the fallen. Even if we sin, they do not forsake us but are always ready to help us, if only we desire it. 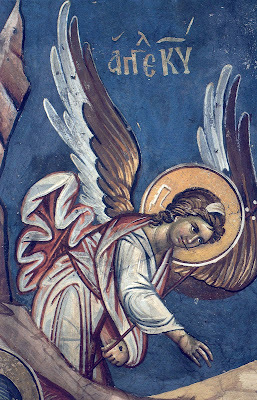 Nevertheless, the name angel is proper to the higher ranks of heaven, for even if each has its own place and position and its own name which accords with the manner of grace bestowed upon it, that is to say, seraphim, cherubim, throne, and so forth, they are still all called angels; for in this sense the name refers not to what they are in essence but to the manner of service they perform. All of them alike are angels, since they fulfill God’s commands, as it is written: "Are they not all ministering spirits, sent forth to minister?" Each order has its own ministry, and their ministrations differ, because the wise Creator does not reveal the mysteries of His divine will to each rank equally. He manifests His sacred will to the lower orders through the higher and through the latter commands the former to fulfill the dictates of His will, as may plainly be seen in the book of the Prophet Zechariah. This book tells how, after a certain angel had spoken with the prophet, that angel met another angel, who commanded him to return to the prophet and to reveal to him the future of Jerusalem. Thus it is written, "Behold, the angel that talked with me went forth, and another angel went out to meet him, and said unto him, Run, speak to this young man," (that is, to the prophet Zechariah) "saying, Jerusalem shall be inhabited as a town withoutwalls for the multitude of men and cattle therein, for I, saith the Lord, will be unto her a wall of fire round about." Saint Gregory expounds, "When one angel says to the other, Run, speak to this young man, there can be no doubt that certain angels dispatch others here and there and that the lower ranks are sent while it is the higher orders that send them." Similarly, we find in the prophecy of Daniel that one angel tells another to explain to the prophet the vision which he saw. Therefore, it is clear that the lower ranks of angels learn of the will and intentions of the divine Creator from the higher orders and are sent by the latter to do His desire. 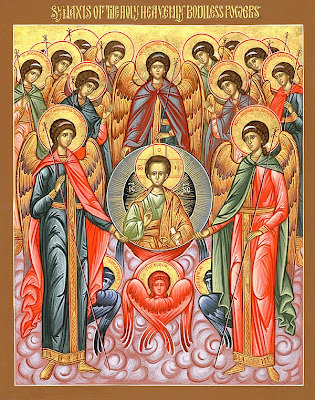 It is fitting that the Orthodox Church here below should celebrate the synaxis and seek the aid of all nine orders of the holy angels on the eighth day of this month of November, sending up fervent entreaty unto them; for on the fearful day of judgment, which the divine teachers of the Church call the eighth day, when He Who is the Son of Man and God, the righteous Judge, "shall come in His glory, and all the holy angels with Him," as the Lord Himself prophesied in the Holy Gospel, all the ranks of angels shall be gathered together. "He shall send His angels with a great sound of a trumpet, and they shall gather together His elect from the four winds" that is, from the east, the west, the north, and the south. 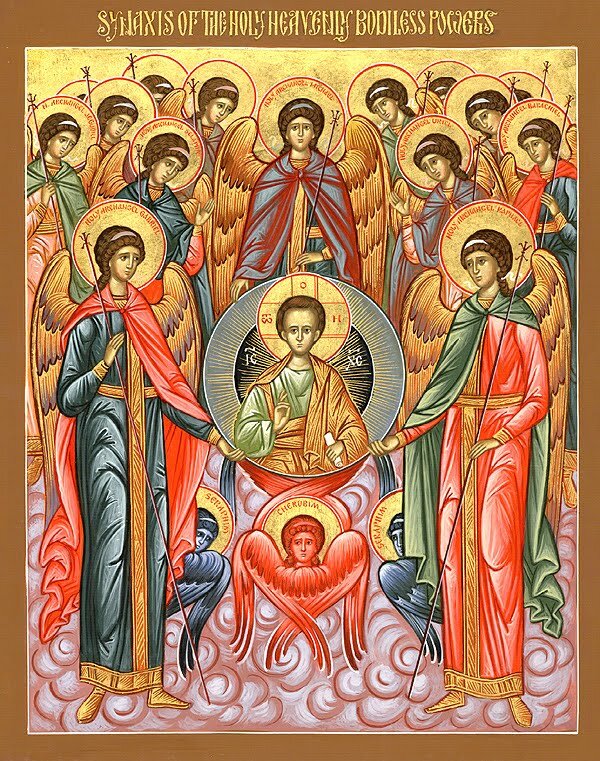 May the Lord then summon us, who reverently celebrate the Synaxis of the Angels, into the choir of the chosen! The holy Chief Commander Michael, the faithful servant of the Lord, was appointed by God as general and commander over the entire assembly of the nine angelic orders. When Satan exalted himself in pride, fell away from God into perdition, and was cast into the abyss, Michael called together all the ranks and hosts of angels and cried out with a mighty voice, "Let us attend! Stand aright before Him Who created us, and do not consider doing what is not pleasing to God. Behold what has befallen those created with us, who until now were communicants of the divine light! Behold how they were straightway exiled from light into darkness because of pride, cast from the heights into the abyss! Behold how the morning star, which lit up the dawn, has fallen to earth and been crushed!" When Michael, who stood foremost among the seraphim, the cherubim, and all the ranks of heaven, said this to the entire assembly of the angels, they glorified the most holy and undivided Trinity, one in essence, the one God; and together they chanted the triumphal hymn: "Holy, holy, holy, Lord God of Sabaoth, heaven and earth are full of Thy glory!" 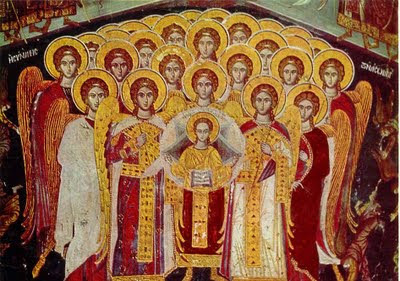 It is this assembly of the holy angels that we venerate on the present feast of the Synaxis of the Angels; for they ever glorify the Father, Son, and Holy Spirit attentively and harmoniously, with one mind, heart, and voice. May we mortals also glorify Him unto the ages. Amen. The local Council of Laodicea, which rejected the impious worship of angels in its thirty-fifth canon but decreed lawful the pious veneration of angels and established the feast of their synaxis, was held shortly before the first great ecumenical council which met in the city of Nicea. The Council of Laodicea was convened in the year 319 after the Nativity of Christ, or according to certain authorities, in the year 320 or 321, while Saint Silvester was Pope of Rome. Thirty-two bishops attended this council, over which the Metropolitan of Laodicea Nunechius presided. Some say that Theodotus was Metropolitan at that time, but it is more likely that it was Nunechius who presided at the council. O Commanders of the Heavenly Host, we the unworthy beseech you, that through your entreaties you will fortify us, guarding us in the shelter of the wings of your ethereal glory, even as we fervently bow before you crying: "Deliver us from all danger, as Commanders of the Powers on high! " Chief Commanders of God; ministers of divine glory; guides for men and leadership of the Incorporeal; as Chief Commanders of the Incorporeal, plead for our welfare and for great mercy. Αναρτήθηκε από ΝΕΚΡΟΣ ΓΙΑ ΤΟΝ ΚΟΣΜΟ στις 10:49 π.μ.